The national minimum wage went up today to $7.25. I live in a state which follows the minimum unlike some states with a much higher minimum wage like Oregon. After my mortgage is paid off and I have saved enough money in reserve, I plan to quit my secure job and go find a fun job whatever that might be. It might be a minimum wage job but with my rental income I shouldn't have a problem covering my bills. My minimum budget includes all of my recurring bills with no extras at all. There is also no extra for maintenance and repairs for my dwelling or car or for additional medical bills or for anything fun. I plan to get a part time job to cover those additional expenses. With a part time, minimum wage job, I will have $534 per month to spend on extras. I think I could live with that. I wouldn't be enjoying any expensive hobbies but $534 is a lot more than I spend right now. I will have a little bit of flexibility too. 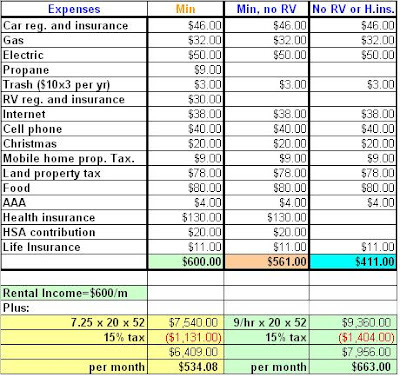 Selling the RV and living in my mobile home or converting my shed to a living space would reduce my bills to $561. And then if I am lucky enough to find a part time job with health benefits, my bills will be reduced to only $411 per month. Then if I found a fun job at $9 per hour, I would bring in $663 per month to spend however I wanted. Having that much money to spend every month would make me feel rich. Isn't it funny how feeling rich is relative? My budget right now is $700 per month for bills. If I don't buy anything extra, sometimes I have $50 left to buy something that I have put off, like specialty light bulbs for the RV. (By the way, I need to buy 2 fluorescent bulbs because I have been moving the light bulbs around as they burn out so that the most used lights have working bulbs but I should really get some new ones.) How fun it will be to work half as much as I am now and then have $500-$600 extra to spend after my bills are paid. That's my goal anyway. I hope it works out. Nice and fun analysis. Your standard deduction and one exemption would cover most of the income from the part time job, so your taxes won't be much at all and nowhere near the 15%. Plus, right now at least, property taxes are deductible up to a point even if you don't itemize. Low taxes are just another benefit of 'being rich' while still in the lowest tax bracket. I took out 15% just in case my rental income pushes me in to a higher tax bracket or there is something else I am not counting. I hope not but I would rather be pleasantly surprised by lower taxes than under-estimate and have to go get another full time job. Oh what a horrible thought! 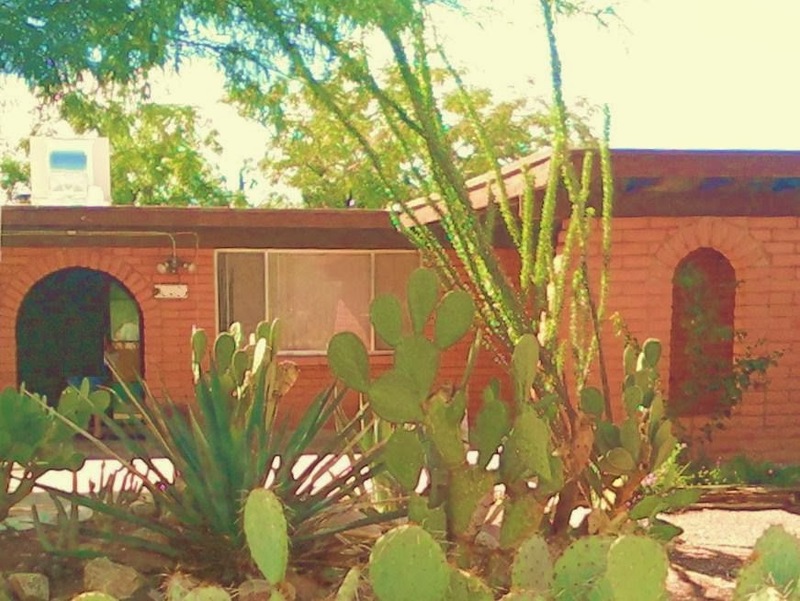 Not sure where rental income goes, but I use it for making rough plans for retirement. After going through everything, my latest plan has me at paying $171 a year in income tax. Not bad. Thanks for sharing your budget in such detail! That is an interesting budget. I like how you have figured out the different options. Another option - which is what I'm planning on doing - is working full-time at a seasonal job and then taking the rest of the year off. It does have some drawbacks. You would be unlikely to get health insurance at a seasonal job and your income wouldn't be distributed throughout the year. But I think the benefits would outweigh the drawbacks. You have really been an inspiration to me and I never miss a post of yours (and even get ancy when you are late!) :-D Thanks for sharing your journey. Budget Nerd Nation, thanks for stopping by! Andy, yes, seasonal is an excellent option especially if I plan to travel some, which I do. LaDawn, I certainly have a big advantage being single. 2 people in this RV would be a challenge although many people do it. If I had a husband I think I would have to have a giant climate controlled garage/workshop for him to hang out in. That might not be as frugal. My goodness, Daizy. That is one low budget! The amazing part is, I know that you are actually doing it now, with the addition of your soon-to-be-gone mortgage payment. Thanks Petunia. Living on a low budget now is good practice. At least I know it can be done. You are living on $80/month for food? That's amazing! Do you feel that you are eating healthy? Care to share tips on how you are doing that? Hi anonymous, I answered your question in my Sun. post today. Short answer is, I live on $100 per month for food now, $80 per month is the minimum estimate for my early retirement calculations. I took out the junk food.